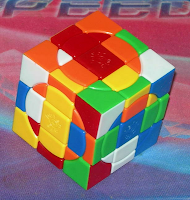 PuzzleMad: When is a cube not a cube? Revisited! Again, I hadn't intended doing another Twisty puzzle review so soon but I am completely and utterly hooked on the damn things. I still blame Tommy and Roxanne although not in an unpleasant way - I am having so much fun with these!!! So I ask yet again: When is a cube not a cube? Nooo! Not more I hear you cry! So here we go - starting with the Skewb. What on earth is a Skewb? It is a "Skewed cube". In my version (the basic) it is effectively a 2x2x2 cube with the cuts twisted diagonally and shifted sideways. Now each of the cuts actually goes through every face. Before you go too blank and shudder away - it really isn't that bad. In effect it is a corner (or vertex) turning cube. It has a long history - it was invented in 1982 by Tony Durham and produced by Uwe Meffert as the Pyraminx cube. That year it was featured in Scientific American by Douglas Hofstadter who introduced the Skewb name which stuck (I think it is quite appropriate). If anyone has a copy of the Hofstadter article then I would love to see it - please Contact me. There are some variants based on this mechanism but as yet I don't have any - soon my precioussss! I bought mine from Tony at Puzl in the UK (it was only £10) but it is stocked by all good puzzle stores including Mefferts and Calvin at HKNowstore. It is quite attractive, with a great mechanism and due to sprung ball bearings within the pieces it clicks as it turns. Just to annoy Mrs S! It is MUCH simpler than a standard Rubik's cube - it only has 3,149,280 possible positions and apparently can always be solved in 11 moves or less! (Although not by me). Solving the Skewb is really quite easy once you have gotten your head around how it moves. I initially struggled even to solve a single face due to the fact that every move cuts every face. But after a while (I'm ashamed to say it was quite a long while! BLUSH!) I got the hang of it. So how to solve the rest? It took me an absolute age to discover something and had to disassemble the cube a few times to do it. This cube can be solved without knowledge of any real algorithms! Just repeat after me: "Down, down, up, up"! Yep! 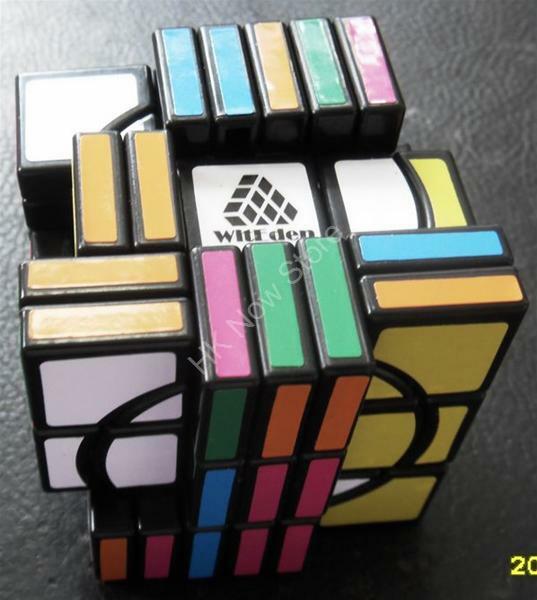 You have solved the Skewb! This sequence of moves has a very interesting effect and is all that you need to solve it - even an old codger like me with practically no memory can do it! If you want to be more efficient then there are a whole load of techniques on the internet explaining it with huge amounts of dizzying notational difficulty. My twisty puzzle friend, Jon (aka SuperAntonioVivaldi) has a superb YouTube tutorial which actually uses the same technique that I discovered. He is a man of similar age to me (so he really should know better!) and also doesn't like to learn lots of algorithms. Next up is a cubic cuboid! What on earth does that mean? The basic Rubik cube puzzles are quite fun and rely on a set of algorithms to solve them. There are many approaches available from Marshall's basic 2 algorithm technique (beautifully explained by my friend Rline here), through Singmaster's top/bottom first system, to the various layer by layer techniques. With each of these systems, you basically choose one and use it. But with this puzzle and its ilk you have to use a combination of techniques from different types of puzzle. This makes it all the more challenging. 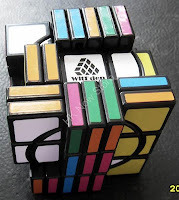 I have noticed from YouTube and the Twisty puzzles forums that the more advanced puzzlers really seem to like the challenge of the cuboid puzzles - these are ones that have differing dimensions on each side. I have to say that I have enjoyed my 3x3x2 (Domino cube), my 2x2x4 (Rubik's tower), my 3x3x4 and finally my TomZ 3x4x5. When two sides have the same order (odd/even) then this allows shape-shifting which really adds to the fun. It's not as bad as it looks, honestly! I bought mine from Calvin at HKNowstore for a very reasonable £17. There are several variants available either in colour and slightly increased difficulty. Despite the incredible complexity, this thing turns beautifully. It is particularly effective at scaring the bejeezus out of your non-puzzling friends! Every single one of them have recoiled in horror when I showed it to them! In terms of solving, I think this one took me a few hours to get my head around. You start with solving it like a standard 3x3 to get the rotated top and bottom faces back to the correct face and then I used similar techniques to my Domino cube (3x3x2) to reorder all the layers correctly. Only one new problem is really encountered and that is the issue of parity. Some of the domino cube techniques cause inner layers to flip over. You don't see this when you only have the 2 layers but it is a real issue with cuboids in general. There is a very easy pair of algorithms to learn to sort this out which can be used in many other puzzles so it is worth the effort. If I can learn it then so can you! I can hear you all screaming at me now (you are screaming now aren't you? If not I am hearing things again!) You are all telling me to stop, please stop! There can't be any more "Not cubes" left to review! Surely not?! Yes - so far I have acquired and solved 2 of the crazy cubes and have more on the way. They are not for the fainthearted - but they are absolutely terrific. In fact I rate my Crazy 4x4 II as highly as I rate TomZ's Curvy copter - that is quite something. If you cannot wait for my review then read reviews of the Gear cube by Gabriel, Oli and Brian. Keep that twisty cube info coming Kevin!! !